Last night, the Priestess of Punk and Prose paid tribute to the Godmother of Goth. Patti Smith channeled her heroine and friend, the original femme fatale, Nico. Soundwalk Collective, featuring Patti’s daughter Jesse Paris Smith provided the instrumentation for this ‘sound exploration’ of Nico’s death in 1988 while riding her bicycle in Ibiza. The stage setup, white bowls in various sizes, several synthesizers, white discs turntables and wind chimes looked like a Yoko Ono performance piece was about to take place. Patti began reciting Nico’s ‘Purple Lips’. It was more of a séance than a concert. We occupied the netherworld where Nico resided all her life, and where she still exists. Beautiful and alone. Patti read several of Nico’s final, unpublished poems and lyrics. ‘My Only Child’, ‘I Will Be Seven’, ‘Saeta’, ‘Evening of Light’ and more. Soundwalk Collective provided ambient drones, soundscapes from nature and sound samples of Nico’s harmonium (which Patti replaced when it was stolen from Nico in 1978). The members of the Collective resemble three Brian Enos operating suitcase synths, while Jesse Paris Smith alternates on wind chimes and manipulates the singing bowls without touching them. Bird sounds, crickets, rustling trees, footsteps in snow and other ambient noise brought Nico’s spirit nearer to us. It was sometimes disturbing and ominous, but alternately serene. 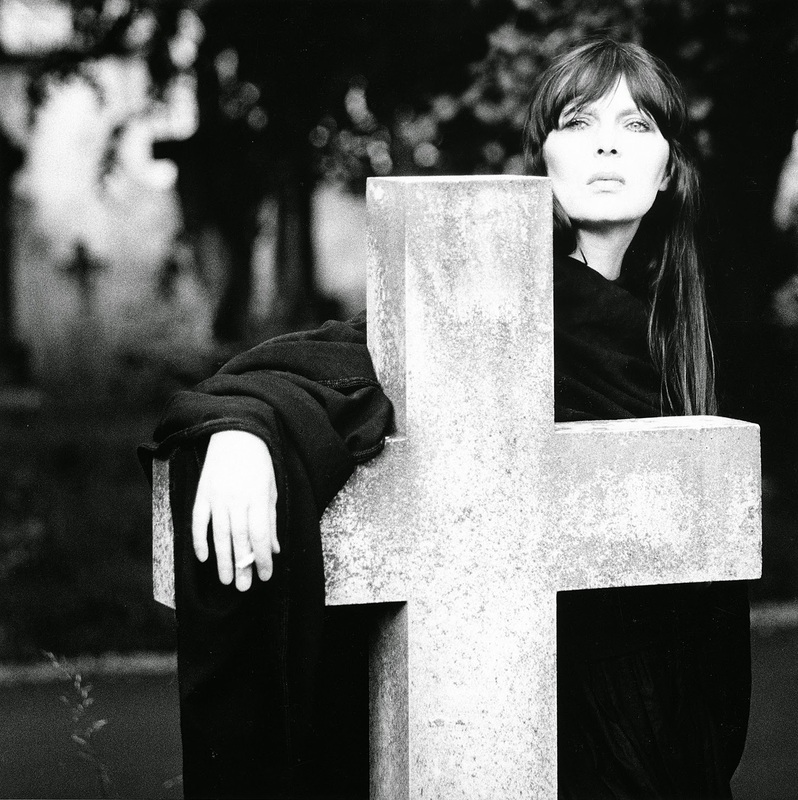 Nico’s lyrics were sacred, creepy, mournful, poetic – like the impossibility of her album title, Desertshore (1970). Her deep Germanic monotone resonated in hypnotic harmonium based melodies, transporting us to a cavernous cathedral. Nico could tell us all about death. She was always so close to it – in a constant state of decay. Nico: A true artist must self destruct. I think I’m already doing it. Don’t you? Can’t you tell by the way I live? It is a continual battle, a drama, being a stranger to myself. I don’t have any references to know who I really am…I mean to be really always in exile. I’m a total stranger to myself. Except sometimes when I get reminded. (The Perils of Nico by Jim Condon 1980). Nico, a war-torn child of 1940s Berlin reluctantly became a supermodel. Then, a stunning ice queen – the tall blonde chick oozing cool in the white pantsuit, singing with the Velvet Underground. She later adapted a more natural and realistic visage – a dark brooding brunette enigma –a crooning cadaver, a phantom – enrobed and shrouded. Her true self. Patti Smith channeled the real Nico, and it was truly haunting.